Weddings mark the start of once-in-a-lifetime unions, and are thus elaborate as they are incredibly personal to the couple and their families. This year saw a string of weddings with a good mix of eclectic; notably Lee Yin Yen & Andrew Kwan’s, and Fei Ping Chang & Lincoln Lee’s ceremonies. Then there were the original, intimate ones, as felt at the nuptials of Cheryl Yeoh & Jason Sew, and Carey Ng & Roen Cian. Some couples observed protocol above all, like Tunku Tun Aminah Maimunah Iskandariah Sultan Ibrahim & Dennis Muhammad Abdullah and Dimash Serikov & Tengku Shaheera Tengku Abdullah. Here, we round up the top 14 weddings of the year that our readers couldn’t get enough of. It was a quiet success for the Johorean Princess's marriage to her Dutch beau at her family’s Serene Hill palace. The wedding was kept under wraps, save for select and discreet Instagrams of guests arriving and witnessing the event. The couple went through the #ttnk ceremonies steeped in royal traditions that culminated in a star-studded evening reception of 1,200 guests at the Istana Besar, Johor Bahru. See the Tatlergram coverage here. This lovely couple stuck to their traditional roots whilst throwing a modern celebration in reflection of their personalities, which shone at a chic reception dinner at the St. Regis KL. The bride’s story behind her gorgeous Carolina Herrera bridal dress for her Hamptons Luxe-themed wedding is a tale she’ll be telling for all time. See the bridal story here. After a 7-year courtship, these lovers walked down the aisle to a resplendent ‘I do’ held at Shangri-La KL. The ceremony featured flowers in every arrangement, height and variety that greeted guests from the reception area. Needless to say, these launched many a snap-happy moment for guests, all the way into the garlanded ballroom. View the garden-like wedding here. This royal matrimony witnessed by Pahang royalty and some 900 VIPs highlighted tradition from start to finish. Decked in green finery, the couple celebrated their marriage at the grand ballroom of Mandarin Oriental, which was further formalised with a ‘nasi adap-adapan’ and rose water sprinkling ceremony. Click here for the full event gallery. Hong Kong’s hottest society couple wed in decadent style in a weekend-long ceremony on the Italian island of Capri. The Insta-worthy affair encapsulated everything rustic and romantic, from lush décor each day, breathtaking scenery, and a dreamlike Giambattista Valli wedding gown. See the best Tatlergrams of their A-list guests here. This couple chose a unique theme of ‘Under the Sea’ for their wedding at The Majestic Hotel KL. A setting of marine elements – complete with 500 fish décor and blue lighting, imparted a sense of tranquility to the lavish reception. A 10-course feast was savoured and the evening landed on a charitable highlight. It was an evening of fanfare and finery for these longtime lovers. The couple was truly king and queen for the evening as they made their grand entrance to a lavish pelamin. Guests, too, enjoyed a jazz-filled evening punctuated with Indian-style elements and dancing, to finish. The beauty queen and restaurateur kicked off their new chapter in life with an intimate event for friends at Signature at the Roof, beneath the setting sun with the wind in their hair. But the cherry on top of the wedding cake was an elegant reception at the Majestic Hotel KL. See the joyous event here. Their nuptials is one of this year’s favourites on our website, and for good reason. 4 weddings of unrivalled resplendence and unique themes were a success for this pair of doctors, despite living and working in different cities. If their fairytale weddings that took them from St. Regis KL to Kuching, isn’t proof that long-distance relationships are achievable, we don’t know what else is. See their bridal stories part 1 here and part 2 here. Two souls united in a series of weddings witnessed by the bride and groom’s respective Kazakhstan and Malaysian friends and families, starting with the official akad nikah, then a wedding reception hosted by the bride’s parents. The colourful affair was anointed with the presence of guests from near and far. See the guests and grandeur in this event gallery. The actress celebrated getting hitched with a four-day wedding spree of special-themed traditional ceremonies and wedding receptions. Despite the hectic nature of their high-profile wedding, the charming couple sported unwavering smiles and couldn’t be their playful, cheerful and loving selves more than ever. Relive the lovebirds' joyous day in this exclusive bridal story. Many brides prefer to leave the wedding trimmings to a planner, but for Cheryl, it was the little details that mattered. The pair married in small but thoughtfully put-together dos in Bali and KL, where almost all the important wedding symbols – from wedding rings, door gifts, wedding cake toppers and even entertainment – were either handmade or executed by the creative, hands-on couple. See our interview with the artsy bride here. The fitness duo ‘eloped’ to the breathtaking Stoneridge Estate in Queenstown, New Zealand, for a lavish 2-day wedding bash that began with a scenic pre-wedding dinner on November 22, 2017. The vows were exchanged in a picturesque outdoor ceremony, framed by rolling mountains, blue skies, and their dearest friends and family. The adorable #LoveLeeToBeKwan hashtag perfectly sums up the perfect day. See the it-crowd who witnessed the unforgettable wedding here. Despite having their very private relationship put under scrutiny, Malaysian TV’s hottest celebrities managed to let their affection blossom from co-stars to marriage, in less than a year. 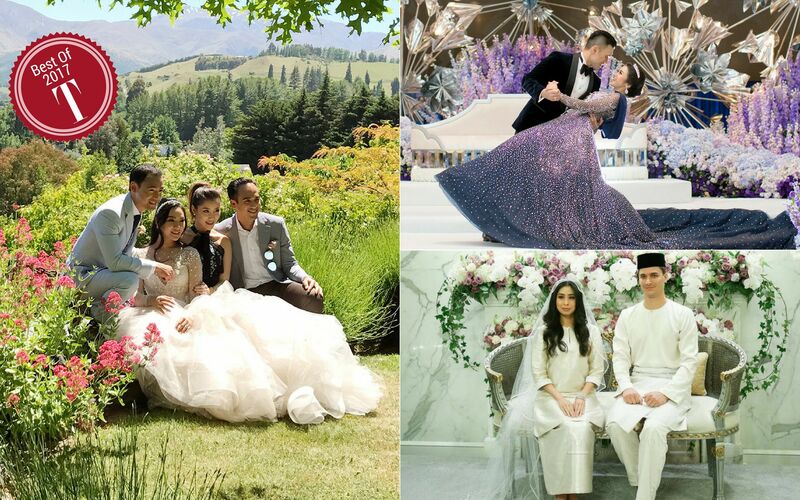 Referred to by the endearing #Fattzura hashtag, the duo got engaged and married within November, through a series of cosy but low-key ceremonies. See our chronicle of their love story in this Couple Spotlight special.